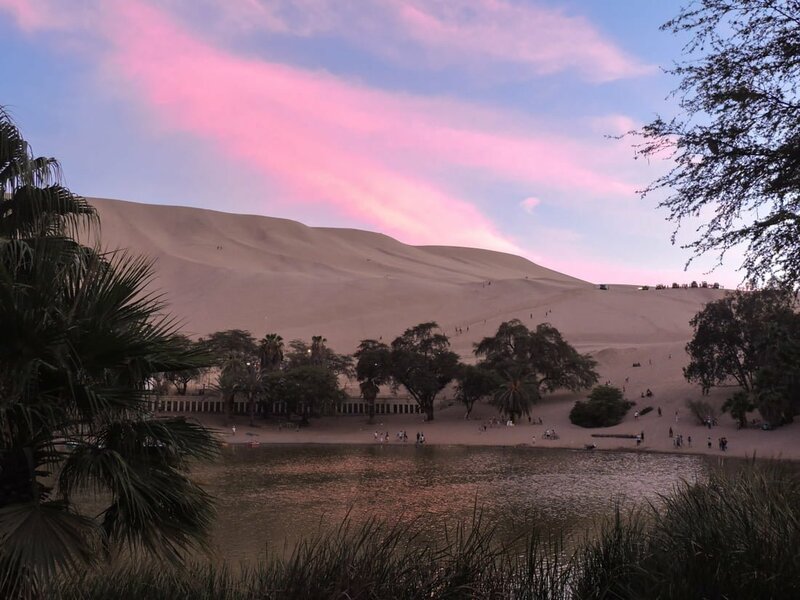 Huacachina (whaka-cheena), a hard name to say but an easy town to have fun in. This south-westerly Peruvian town Huacachina is built around a lagoon surrounded by massive orange sand dunes. The streets of the oasis are slightly run down, however, they are not the main attraction, the Peru sand dunes are! Why? Because visitors get to hike to the top and sandboard down. Then as dark draws in, the weekend party scene fires up for locals and tourists alike. 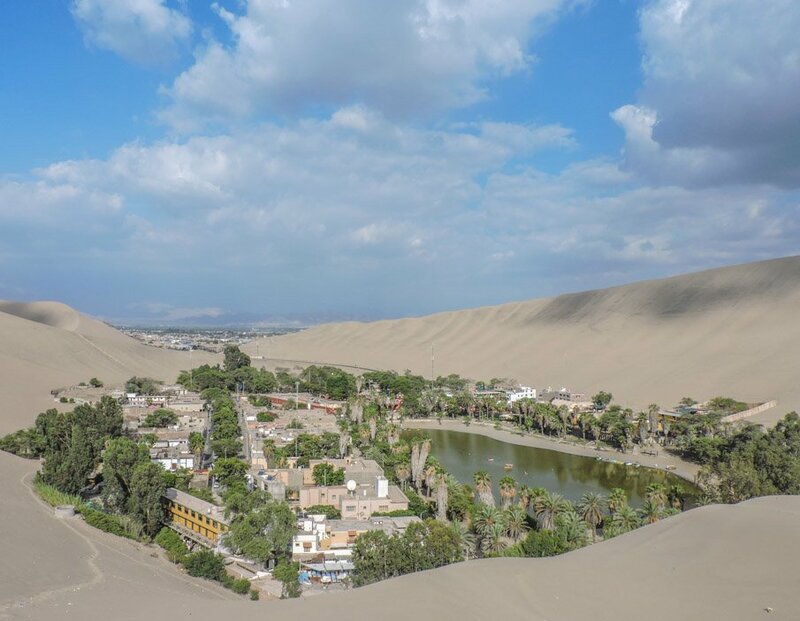 This neighbouring town of Ica should feature on every South American itinerary to tick off the top things to do in Huacachina, Peru. 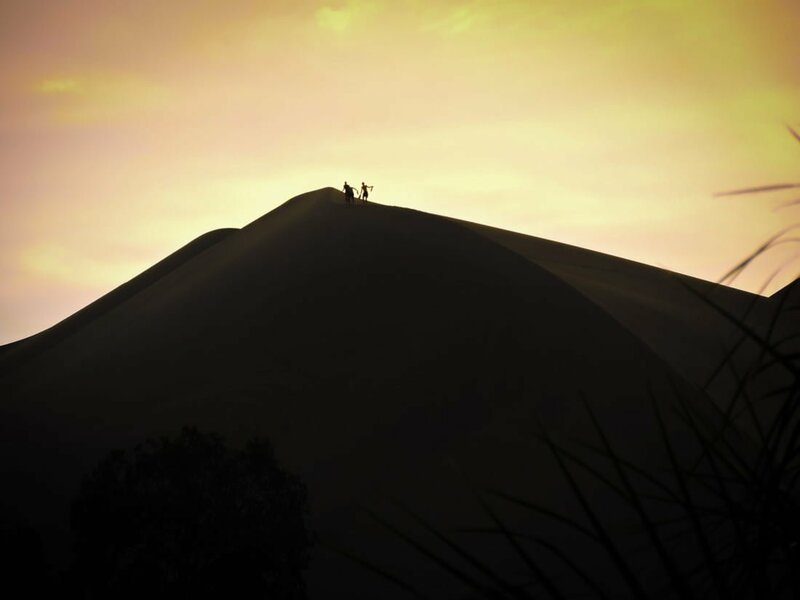 Top of the list of what to do in Huacachina is to hike or take a buggy ride to the top of the sand dunes, sit/stand/ski on a board and fly down the sandy dunes like you are sledging on snow. It is exhilarating and the main reason that people don’t bypass this mirage of a town. 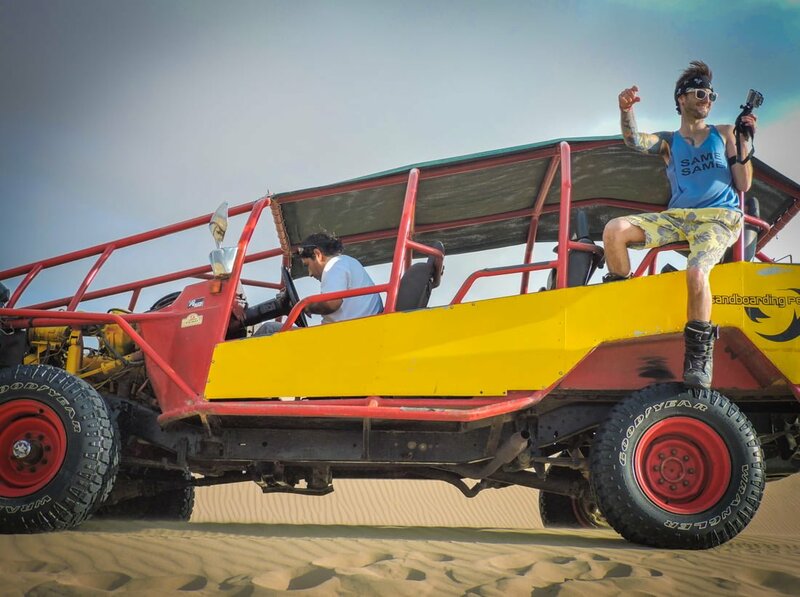 There are many companies which offer sandboarding tours of Huacachina and they vary in price but start around 30 soles and trip lasts around two hours. 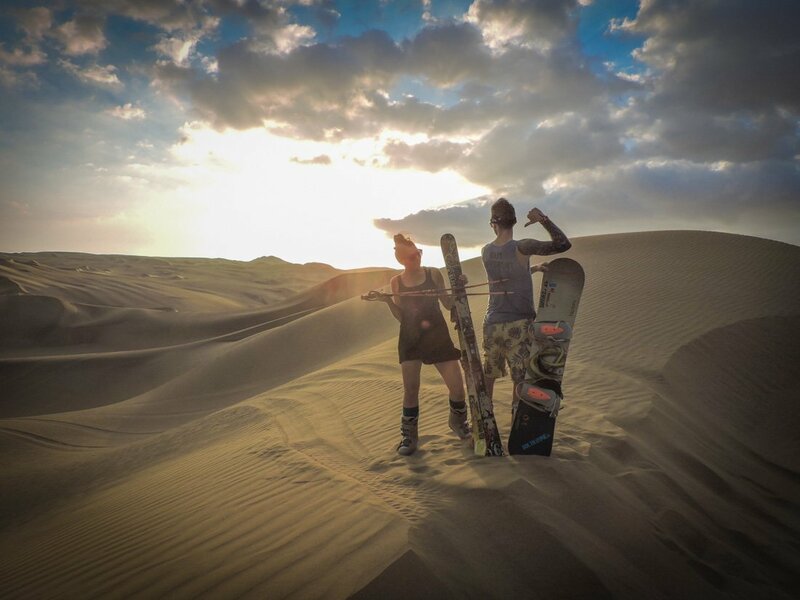 We (Gemma and Craig) always love a challenge to skipped the boarding for sand-skiing with the only professional sand-ski team, Sandboarding Peru. Read more: why sand board when you can sand ski? Dune buggies are like big creepy crawlies on wheels. The beasts take to the dunes at speed as revellers squeal. It is a bumpy ride not for the hungover! The dune buggy experience is usually teamed up with sandboarding stops for those looking to shuffle down on their bottoms or attempt to stand. The boards are not the highest of quality so if you are serious about boarding you should see our tip above. Warning – there are lots of reviews online (TripAdvisor especially) that state that the quality of the dune buggy ride is all down to the skills of the driver so choose your company wisely. these hydration tablets after painting the town red on a Saturday night. The bar, Huacaf*ckingchinas (HFC) is the liveliest with its open front seating area and dance floor upstairs. Casa de Arena is the next stop, Huacachina’s nightclub which is pretty sizeable and jampacked with Peruvians and holidaymakers. For low key cocktails and pre-party drinks, grab a cocktail at Banana’s Adventure. Sip a smoothie by the small swimming pool of Banana’s Adventures or swing on a hammock after gorging on the best food in Huacachina. Banana’s hostel also puts on a social BBQ night at 8pm every night (we weren’t convinced there was enough food for everyone). Peru’s national drink is Pisco (the alcoholic one anyway, Inca Kola is the soft drink) and you can visit the very place where this Peruvian brandy is made. Pisco tours from Huacachina also discuss red wine which is also made in the Ica area which is surprising when you consider that Huacachina is a desert. Most Ica wine and pisco tours include a visit to two-three different wineries and tasting opportunities (around 2-4 hours). 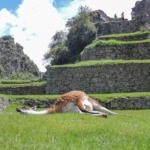 If you decide to tour Peru with Peru Hop, the hop on/off backpacker’s bus you will receive a free tour on your way to Nazca. Was it an alien or a man-made creation? That’s for you decide when you visit the Nazca Lines. Due to the scale of the geoglyphs, you need to look down on designs in the ground so helicopter tours are the best way to view if interested. If it kind of tickles you fancy but you don’t want to shell you out can pay a couple of soles to climb up a viewing point and peer down. Altnertivaly, you can spot a shape at Peru’s Islas Ballestas. 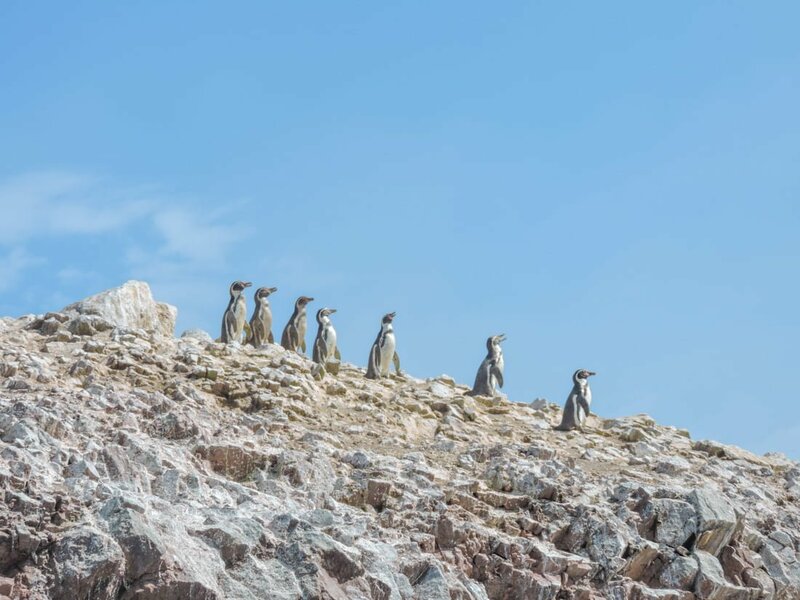 Take an Islas Ballestas boat tour to spot sea lions and coo over the cute penguins. This boat tour takes just over two hours, life jackets are provided and for the safety of customer, do not run during bad weather. If you do board the boat, look out for The Candelabra shape in the dunes. The tour takes off from the town of Paracas but some companies will collect you from Huacachina at around 06:30. This is one of the most popular Huacachina tours in Peru. This beach is pretty spectacular. The contrasting red, crust-like edge strikes against the blues of the sea at Paracas National Reserve. 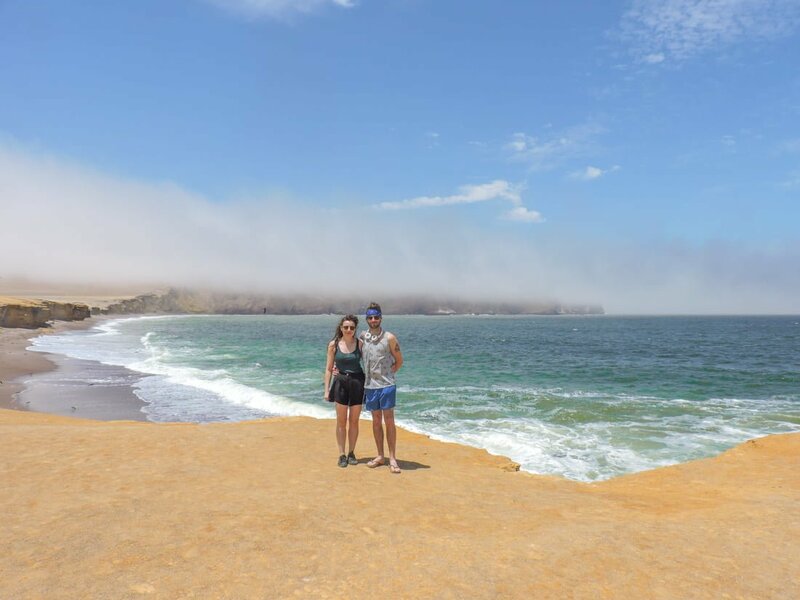 We did this as part of the Peru Hop tour from Paracas to Huacachina. 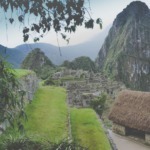 You can most types of food in Huacachina from typical Peruvian meals like ceviche (raw fish cook in lemon acid with corn and coriander) at El Cordon y la Rosa to vegan options at La Casa de Bamboo (try the quinoa soups in Peru). If you are after some comfort food like burgers and fries check out Desert Nights hostel. In need of pizza? Head to Wild Olive. Unfortunately, most restaurants in Huacachina do suffer from mixed reviews. We stayed at Bananas Adventures. After a bump in the road re poor communication when we were trying to change arrival dates, we were happy with our choice. There is a pool, lots of hammocks, a thatched roof bar that serves the most delicious mango milkshakes and a variety of food (falafel, burgers, pancakes, Thai curry to name but a few). Breakfast of eggs and bread is included if you pay extra. We just purchased bananas and bread for breakfast from a local shop. Oh, they have PUPPIES! And cats. The most unique hotel in Huacachina is Desert Nights Ecocamp. This glampsite is set up on the dunes looking down on the oasis and don’t worry, there’s no sleeping on the floor as tents have double beds. This accommodation also has a swimming pool, bar and cafe/restaurant. Hotel El Huacachinero has private bathrooms, shared lounge, swimming pool and is a three-minute walk from restaurants and bars. 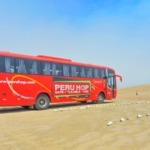 Getting to Huacachina from Lima is easy if hire a car (four hours), use public bus (five hours, buses go to Ica then take a taxi to Huacachina) or use the only direct bus – Peru Hop (stopping a Paracas if you wish). Alternatively, you can travel from Arequipa to Ica (11 hours, then taxi) or Cusco (19 hours to Ica then taxi). Peru really does offer such a variety of landscapes and Huacachina gave me the chance not only to sand-ski and board down a dune but to also sleep in an oasis for the first time, and then wake up with a hangover! 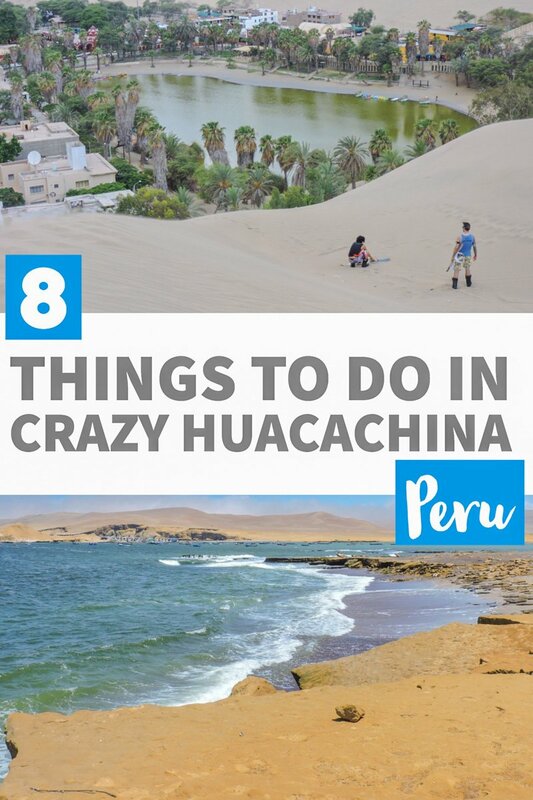 Just three of the fun things to do in Huacachina during your Peru adventure. We like to chat, leave us a comment or questions below! No one warns you eh?! Getting our bank card stuck in the ATM in Ica was pretty terrifying. Huacachina is fuuuuun.